Review Summary: On the whole 23RD MARCH 1931 SHAHEED lacks the power to motivate the viewer. On the whole 23RD MARCH 1931 SHAHEED lacks the power to motivate the viewer. 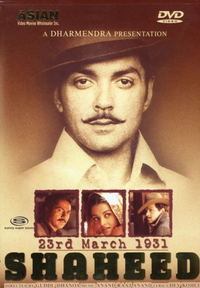 23rd March 1931 Shaheed, the other big Bhagat Singh tribute is a more commercial film. With the Sunny Deol, Guddu Dhanoa and Tinnu Varma triad, it becomes a flying kicks and heels action tribute to the freedom fighter.